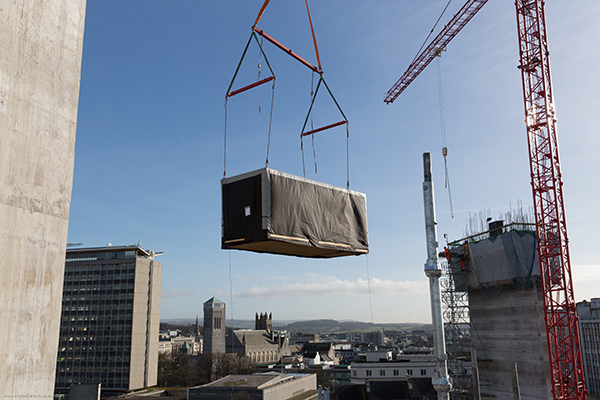 Plymouth student accommodation scheme is taking shape with just 90 Room Modules left to be installed. Elements Europe’s haulage team are now delivering 12 modules per day from its manufacturing facility in Telford. These are then installed by the professional on-site installation team. Once all Room Modules have been installed Elements Europe will commence delivery and installation of 60 Bathroom Pods for the second of the two tower blocks, which will be built traditionally but will benefit from a Bathroom Pod solution so to negate the need for excessive on-site mechanical and electrical works. The progress of the development is being captured on film by Plymouth production company Sound View Media Limited who have been on-site to capture the install of Room Modules and will continue to film through to the finished building. The video will be available to view on our website later this year.